November is San Diego's shoulder season, tourist-wise. Early in the month is a great time to visit if you want to enjoy the attractions without elbowing your way through the crowds. Those quiet conditions will continue through the middle of the month. After that, things get busy. Thanksgiving is celebrated on the fourth Thursday of November, and many people also get the following Friday off from work, which gives them a four-day holiday. November is the beginning of San Diego's rainy season, bringing the most unpredictable weather of the year. Although the rain doesn't peak until January, the monthly rainfall may happen all on the same day, especially during winter storms. You'll have about 11 hours of sunlight per day to explore San Diego in November. Water-wise, the ocean gets cold enough by November that local surfers start to look like they're in NorCal instead, wearing boots and hoodies over thick wetsuits on their way to the waves. 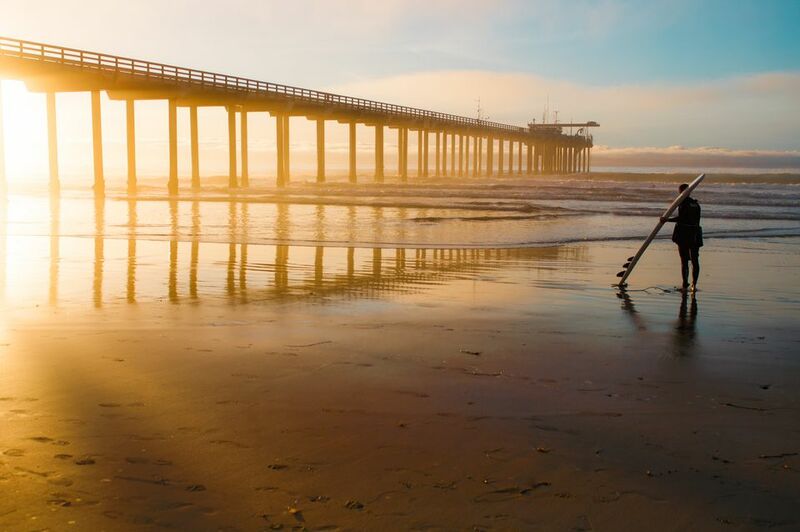 Cold water aside, the surf is fantastic as San Diego's best surf season continues through November. Long-sleeved shirts and sweaters in layers work best. Casual clothing is always in style in laid-back San Diego. That is, unless you want to get all glammed up and go partying in the Gaslamp Quarter. Pack an umbrella or rain jacket with a hood for rainy days and a warm jacket if no rain is predicted. Hoodies are a good choice in case a cool breeze or evening chill makes you uncomfortable. You won't need a winter coat unless you plan to take a side trip to nearby Julian or up to Big Bear Lake. You'll find a few fall festivals happening in November, and Christmas holiday events start ramping up around Thanksgiving. Mother Goose Parade: The town of El Cajon has been celebrating with this cute little parade for more than 60 years. In fact, many locals consider this event the unofficial start of the Christmas season. San Diego Jazz Festival: Some jazz music fans call the San Diego Jazz Festival "the crown jewel of jazz festivals." Performers represent a wide variety of traditional jazz: classical, Dixieland, ragtime, swing, and rockabilly styles. They perform in venues that range from small, intimate listening rooms to large concert halls with dance floors. San Diego Beer Week: Instead of gobbling turkey and tasting the trimmings, you can celebrate the city's vibrant craft brewing scene during this "week" that actually lasts 10 days. Fall Back Festival: You might think they're talking about the annual process of resetting your clock to end daylight savings time, but this event falls back even further. Time travel to the 1880s when the Gaslamp Quarter transforms into a western town of the past. Autumn in San Diego ends in November. For some seasonal things to do, try the guide to San Diego in the Fall. Daylight Savings time ends in early November, which will push the clocks back and make it seem like the sun is setting earlier. Many local attractions may change their hours when that happens. While crowds are lower in early November, hotel rates will be too, making it a good time for a trip if you want to save money. But it's a different story during the Thanksgiving holidays.